It's 7pm, you've got £5 in your pocket and an empty stomach. Looks like a sandwich is the most likely option, unless you want to go down the greasy burger/chips route. Or you could take that fiver to a kebab shop. Not just any kebab shop: Dosa Park. Because as I discovered, not all kebab joints are created equal. In fact, some aren't really kebab shops at all. You've probably passed by Dosa Park on your way to and from Oxford train station and not spared it a second glance. Unless you found yourself in the aforementioned famished in possession of a fiver situation. Then you might have wandered in and realised they serve far more than just various combinations of meat + chips: they also serve South Indian food. The clue's in the name, really – a dosa is a savoury rice pancake popular in the south of India, as well as in South East Asian countries such as Malaysia and Singapore. In the UK, we're much more familiar with curries from the north of India, Bangladesh or Pakistan, so dosa can be hard to come by. 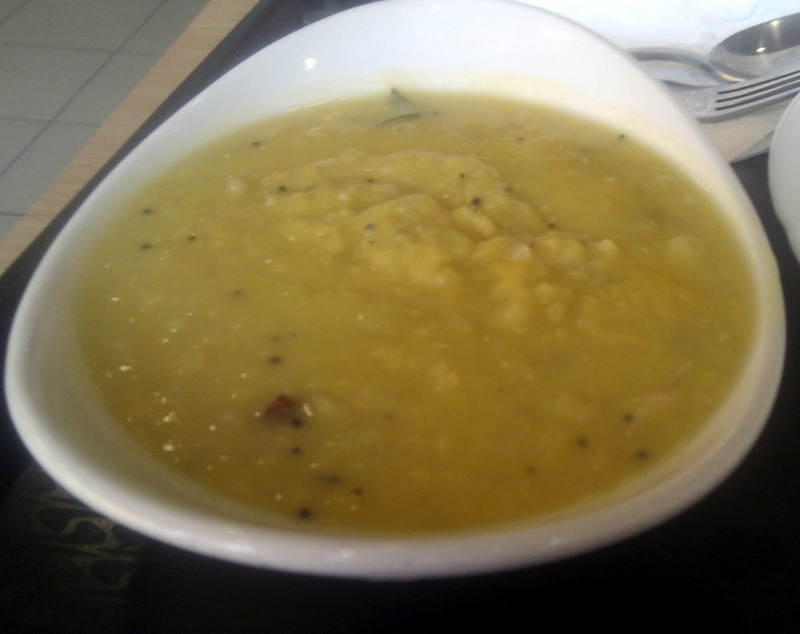 Oxford now has three purveyors of this light, crispy stomach filler: Chutneys, Trichy Dosa and Dosa Park. The latter may look like any other greasy kebab shop, but its cheap cooking gives much pricier Indian restaurants a run for their money. Glamorous it is not, so unless you're a fan of perching at one of three tables in the admittedly petite interior, you might prefer to take away. You don't even have to pop down to the shop itself to order: they offer free home delivery. M and I visited one evening mid-week, and found another table of girls tucking into dosa and a thali plate, plus plenty of customers dropping in and out for their kebab & chips fix. You can tell the staff prefer to serve Indian food though, and were happy to talk us through the options available. 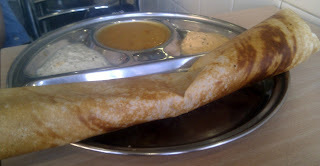 Dosa start at £3 for a plain pancake served with dipping sauces, and the most expensive item on the menu is the £5.99 meat thali (selection of curries, rice and sauces, with a pappadum). If you don't fancy trying a dosa, there are also biryani dishes and both meat and veg-based curries on offer. We opted for a plain and a masala dosa (stuffed with potatoes in a lightly-spiced sauce), a dhal (vegetarian lentil curry), some plain rice and 2 mango lassi, for the very resonable outlay of £15. Within ten minutes, our table was heaped with piping hot goodness: Dosa Park don't skimp on the portion sizes. The consistency of the dhal was a touch too liquid for my liking, but the taste was spot on; the creaminess of the lentils offset by a peppery note. The dosa were presented on silver platters (Trichy Dosa and your plastic school dinner trays, take note) with dipping sauces, and were crispy and delicious, particularly the masala dosa, which was filling enough to be a meal in its own right. The lassi were also tasty and the perfect complement to our food. So, next time you have a curry craving close to pay day, make Dosa Park your destination. It's cheap but not chic – but when the food's that good, who cares? Dosa Park is at 21 Park End Street, OX1 1HU. Tel: 01865 791197. We love this place. The non-veg thali combined with the kal dosa are our favourites, and really good for two people, all under 10 quid. Lassi is great too! Sami, I agree that it's great value! Krista - they're not all that common in many parts of the world I suppose... but you definitely need to try one and I hope you'll be back in Oxford soon!